The name of the game in New Super Mario Bros. 2 is finding and collecting as many coins as you possibly can. The goal is to reach 1,000,000 coins collected. As a whole, New Super Mario Bros. 2 players have now broken 300,000,000,000 coins collected. That number is scary high, and it only represents players with both Spot Pass and wireless features enabled on their Nintendo 3DS handhelds. In celebration, Nintendo has released a free level pack for the Coin Rush mode. The pack sports a classic theme, and it can be downloaded right now from the Coin Rush menu in New Super Mario Bros. 2 for free. Nintendo even posted a Nintendo Direct Mini, which you can see at the head of this article, to announce the news and preview the new levels. The levels were designed with inspiration from Super Mario Bros. and Super Mario Bros. 3, two classics in this franchise's history. The first one, for instance, is nearly identical to the first level in Super Mario Bros. for the NES. While the pack is free right now, it will cost gamers $2.50 starting on February 1st, 2013. So, if you have Nintendo 3DS or will get one on Christmas, make sure you hop online and snag this freebie while the price tag is missing. REDMOND, Wash.–(BUSINESS WIRE)– Nintendo fans worldwide have amassed a mountain of more than 300 billion gold coins in New Super Mario Bros. 2 for the Nintendo 3DSsystem, and the tally continues to climb. To reward players for hitting this massive milestone, Nintendo is offering a free pack of Coin Rush courses that game owners can download wirelessly within the game at no extra charge (broadband Internet access is required). The free Gold Classics Pack was inspired by games like Super Mario Bros. and Super Mario Bros. 3, and includes three new courses that can be played in Coin Rush mode. Players can test their skills, then share and challenge other players' records through the StreetPass feature. 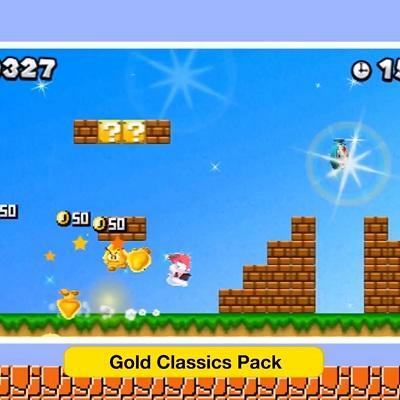 The Gold Classics Pack is now available and will be free for a limited time to New Super Mario Bros. 2 owners. Starting Feb. 1, 2013, the pack will be available to purchase for $2.50 in the United States. A variety of other downloadable Coin Rush course packs are available for purchase through the New Super Mario Bros. 2 game. "Nintendo fans have once again demonstrated their passion for the Super Mario Bros. franchise," said Scott Moffitt, Nintendo of America's executive vice president of Sales & Marketing. "The Gold Classics Pack is just one small way for us to thank players for their dedication. We're all eager to see just how high that coin tally can get." New Super Mario Bros. 2 is the side-scrolling follow-up to the smash-hit original. It challenges players to complete levels while collecting as many coins as possible. Every level is littered with gold coins, and players will find numerous power-ups and bonuses to help them collect even more coins. It's the first hand-held Super Mario Bros. game that lets two players play through the entire game together as Mario and Luigi. The game is available in stores, or can be downloaded from the Nintendo eShop for $39.99 in the United States. For more information about New Super Mario Bros. 2 and how to download the free Gold Classics Pack, visit http://newsupermariobros2.nintendo.com. About Nintendo: The worldwide pioneer in the creation of interactive entertainment, Nintendo Co., Ltd., of Kyoto, Japan, manufactures and markets hardware and software for its Wii U™and Wii™ home consoles, and Nintendo 3DS™ and Nintendo DS™ families of portable systems. Since 1983, when it launched the Nintendo Entertainment System™, Nintendo has sold more than 4 billion video games and more than 637 million hardware units globally, including the current-generation Wii U, Nintendo 3DS and Nintendo 3DS XL, as well as the Game Boy™, Game Boy Advance, Nintendo DS, Nintendo DSi™ and Nintendo DSi XL™, Super NES™, Nintendo 64™, Nintendo GameCube™ and Wii systems. It has also created industry icons that have become well-known, household names such as Mario™, Donkey Kong™, Metroid™, Zelda™ and Pokémon™. A wholly owned subsidiary, Nintendo of America Inc., based in Redmond, Wash., serves as headquarters for Nintendo's operations in the Western Hemisphere. For more information about Nintendo, please visit the company's website athttp://www.nintendo.com.